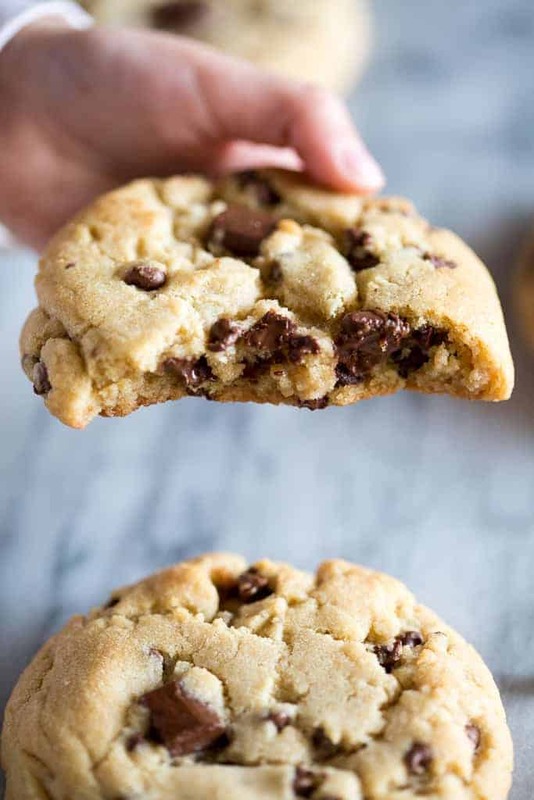 These Jumbo Chocolate Chip Cookies are made from scratch, extra thick and chewy chocolate chip cookies. They have a slight crisp on the outside and are soft in the center, with plenty of chocolate morsels throughout. 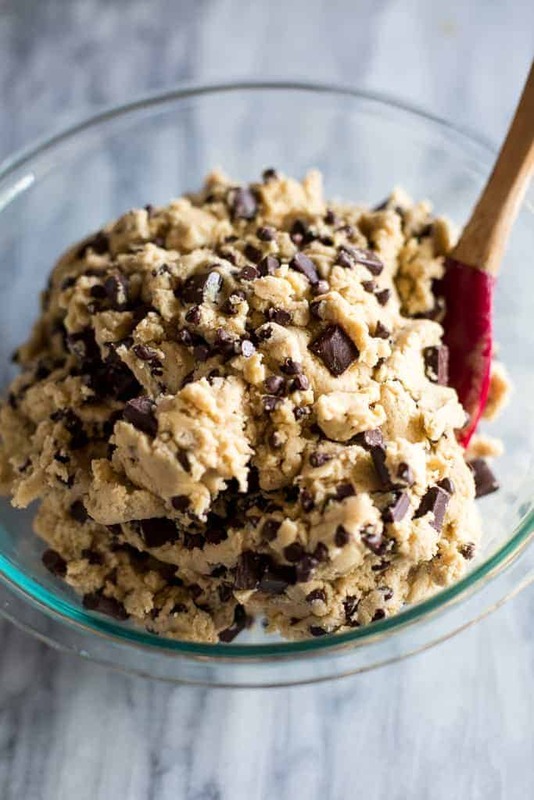 My kids love baking cookies together on the weekends, especially helping to measure and pour the ingredients and sneak bites of cookie dough. Some of our favorite cookie recipes include Super Soft Sugar Cookies where they can cut shapes out of the dough and Homemade Oreo Cookies. 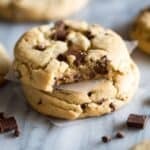 This fun and easy chocolate chip cookie recipe is my new favorite way to make them and they’re better than anything you’d find in a bakery! Next time I make them I may even dip half the cookie in chocolate for an extra measure of WOW! Gradually mix in the flour and mix until combined. Use a 1/4 cup measuring cup to scoop spoonfuls of dough onto prepared cooke sheet, about 2 inches apart. Bake for 12 to 15 minutes or just until light golden brown around the edges. Do not over bake. Let stand 1 minute on cookie sheet, then transfer to cooling rack to cool completely. 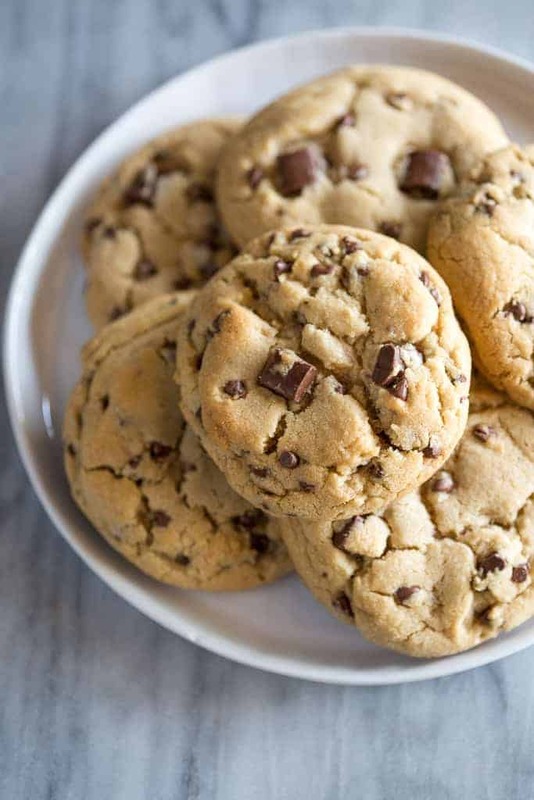 Cookies often become thin when they spread too far during cooking. 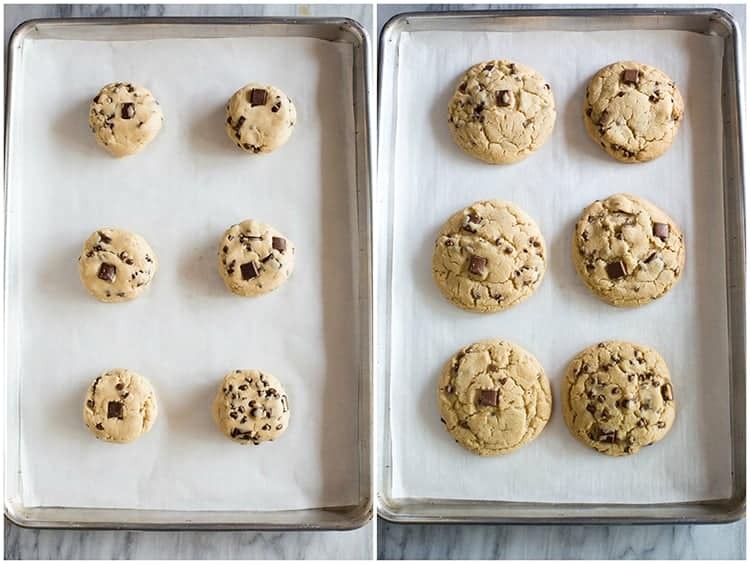 To ensure your cookies stay thick and not thin and flat, make sure to measure carefully, and be sure the butter isn’t warm, but just room temperature. You also may chill the dough for 30 minutes before dividing it into balls on the cookie sheet, which can help can prevent spreading, but isn’t required in this recipe. Another important note is that you don’t want to place cookie balls on a hot baking sheet. All-purpose flour is my preferred flour when baking cookies (and most baked goods)! This recipe was developed with all-purpose flour and adjustments have been made to ensure thick and chewy cookies with this type of flour. The primary difference between cake flour and all-purpose flour is in the protein content. Cake flour is a low protein flour that has a very fine texture because it has been finely milled. If you’ve ever had angel food cake, this is a great example of how cake flour can make certain baked goods really light and fluffy. If you are using self-rising flour, remember that salt and baking powder have been added so you will want to eliminate both from the recipe. Just made these cookies and they are amazing. 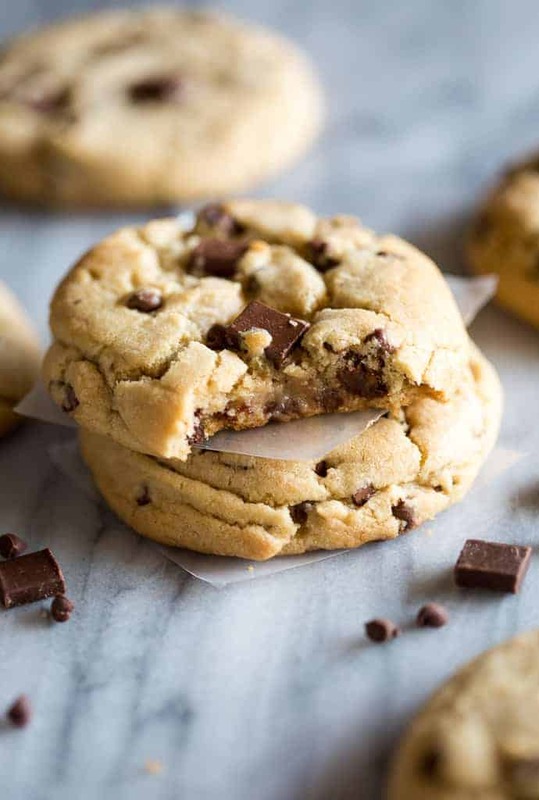 I have a recipe I always use that people love and I just tried these out on my boyfriend (the chocolate chip cookie connoisseur) and he said these are the best yet! Even better than my family recipe. I’ll keep this recipe around for sure! Cakey and chewy and just a slight crisp on the outside, they’re great. Wow, just finished baking a batch of these Jumbo Chocolate Chip Cookies and this may be the best chocolate cookie recipe I have ever used! Thanks for sharing Lauren. I live in a higher altitude and am always concerned that something will to wrong whenever I bake, even though cookies are usually not an issue, you never know and oftentimes have to play around with baked good recipes to get the right touch. Followed your recipe to a T and all was fantastic. Love that these are oversized, crispy on the outside and chewy in the middle. Yum! These cookies are wonderful! I made them for my team and everyone raved about how good they were! A perfect amount of soft and chewy in the middle and a crisp outside makes these so yummy. I highly recommended!